Keto Bitterleaf Soup is for you if you need a low carb Nigerian Bitterleaf Soup that does not contain a starchy thickener in your life. That means no cocoyam, no quaker oats, no flour, nothing starchy at all yet it tastes like Bitterleaf Soup. Keto Bitterleaf Soup is great for weight loss and for all those looking to reduce carbs in their diet. Cow ribs contain lots of fat which is perfect for those on a keto diet that's why I recommend it for this soup but if you are not on a keto diet, you can use any part of beef. You can use dried, washed and squeezed bitter leaves but you need to first of all make the bitter leaves soft and fresh again before adding them to the soup. The catfish acts as thickener for the soup. Alternatives include conger eel (which I used in the video below) or any white fish that can make a great thickener. 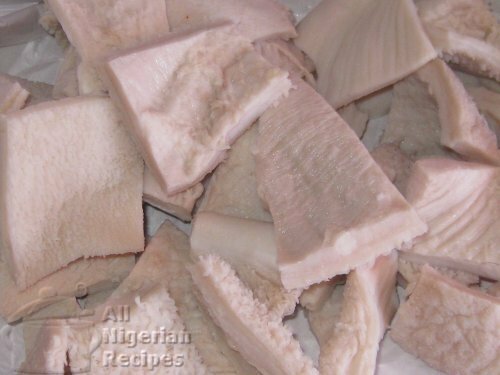 If you do not have Ogiri Igbo (it gives Bitterleaf Soup a traditional taste), you can skip it and use only seasoning cubes..
Cut off the skin of the catfish or conger eel. See the video below. Put the meat and skinned catfish into a pot, add the seasoning cube, pour water to cover them and start cooking. When the catfish is soft, debone and break into pieces then pound in a mortar till smooth. You can also use a food preocessor or a normal blender (with as little water as possible) to turn it into a smooth puree. 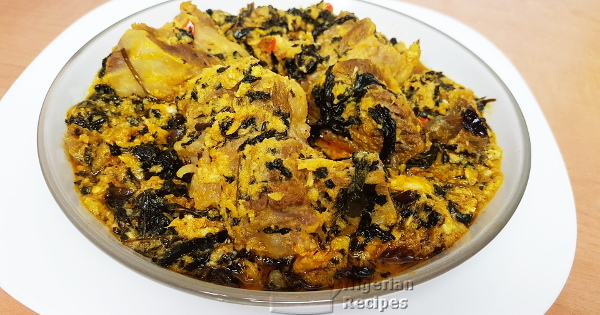 When the meat is done, add the ogiri, crayfish, dry fish (soaked, cleaned and deboned), pounded catfish, bitter leaves and palm oil. Cover the pot and continue cooking on medium to high heat. Once the bitter leaves are soft, add pepper and salt to your taste. Stir very well and it is done! Serve with any keto or low carb fufu meal. If you are not on a keto diet, serve with any Nigerian fufu meal.